One of the things that makes Boston such a remarkable city is its long, storied past. And so many chapters of that history are written in the city’s architecture. From beautiful old theaters like the Paramount and the Opera House, to classic Art Deco-style office buildings in the Financial District, to beloved Fenway Park, an abundance of magnificent structures give Boston its unique visual character, drawing thousands of picture-snapping tourists from all over the world and reminding locals of the city’s fascinating heritage. The Boston Preservation Alliance is devoted to maintaining that character as the city continues to grow and evolve. The nonprofit organization endeavors to create awareness about the importance of preservation and aims to achieve legal protection for certain historic structures and resources that are subject to demolition. 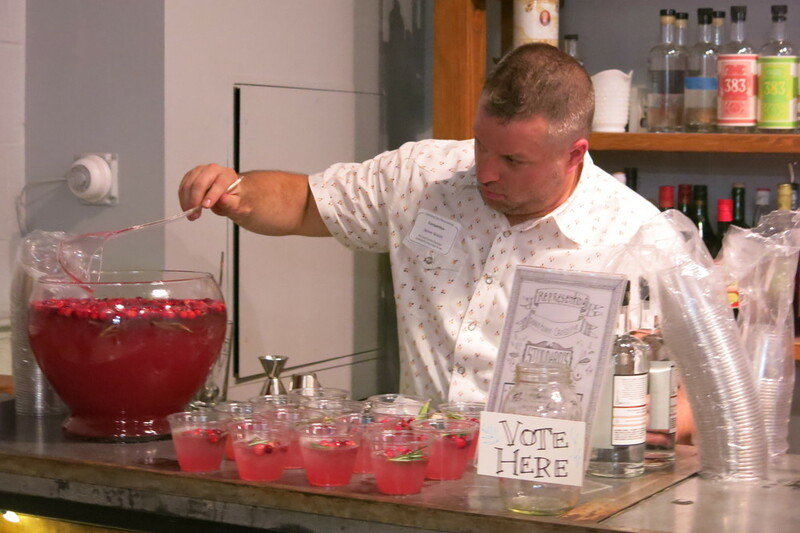 In that sense, the group would have been hard-pressed to find a more appropriate venue than GrandTen Distilling for its most recent fundraising event, Libations for Preservation. The South Boston building that houses GrandTen’s distillery dates back to the 19th century, when it was an iron foundry and later a wire works. GrandTen took over the site a few years ago, completely refurbishing the then-decrepit building but keeping some of the original infrastructure, such as rafters and support beams. And thus the old foundry’s spirit lives on, while the spirits distilled within its walls continue to win over modern-day drinkers and mixologists. Imbibers and bartenders alike mingled with history buffs and preservationists this past Saturday at GrandTen Distilling for Libations for Preservation, a cocktail competition pitting mixologists from six Boston bars against each other in a boozy battle royale for a good cause. 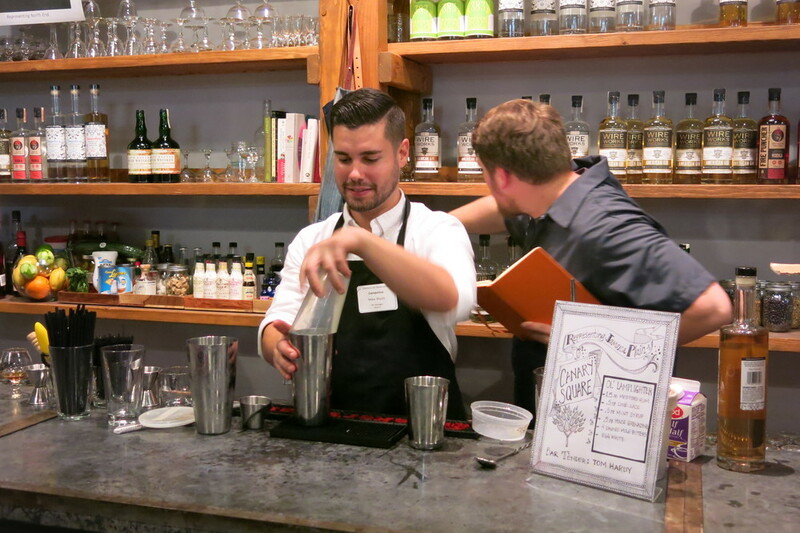 Each participating bar represented a different Boston neighborhood, and each competing bartender was charged with devising an original cocktail using at least one GTD spirit. 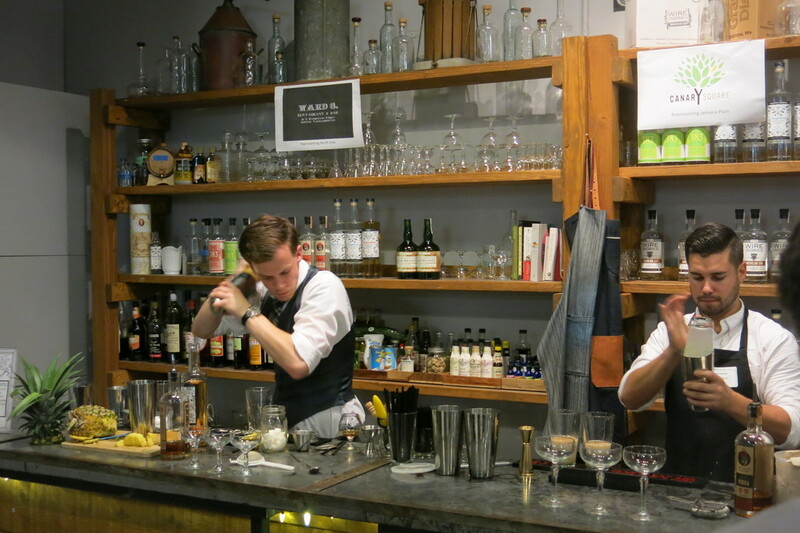 Their drinks would be voted on by the event’s 60+ attendees, culminating in two bartenders moving onto a final round to battle for cocktail supremacy. The normally pragmatic distillery was all decked out for the occasion. There were wooden high-top tables, a big spread of food, and a band keeping things lively. At the helm was GrandTen brand ambassador Lonnie Newburn, who among his innumerable daily responsibilities, can now add “emcee” to his resume. With all appropriate fanfare and ceremony, Round 1 commenced. The six combatants had been split into two groups, and the first three began composing their libations. The opening salvo was fired by Tom Hardy of Jamaica Plain’s Canary Square. Tom’s drink, the Ol’ Lamplighter, combined Medford rum, lime juice, mint syrup, house grenadine, mole bitters, and egg white. This was a smooth, well-balanced cocktail, with a little sweetness from the grenadine, notes of cocoa and spice from the bitters, and a creamy texture on account of the egg white. 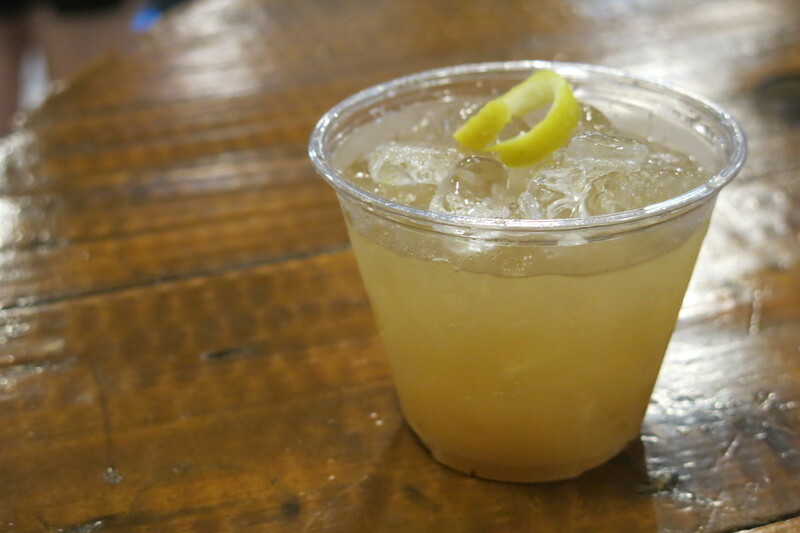 Dave Fushcetti of Lincoln Tavern in South Boston countered with the March 17, 1776, a blend of Wire Works gin, pear puree, rosemary- and clove-infused syrup, and lemon juice. The herbs and spices in the syrup paired well with the botanicals in the gin, and the pear puree provided texture and some muted sweetness. Jamie Walsh, bar manager of Stoddard’s in Downtown Crossing, closed out Round 1 with the Temple Bog. Attractively garnished with cranberries and sprigs of rosemary, this dry, tart punch invoked the flavors of autumn with Wire Works gin, GTD Craneberry liqueur, cranberry juice, lemon juice, and ginger syrup. The fresh aroma of rosemary was present in every sip. The crowd congregated around the bar, sipping and discussing the cocktail samples. It was a difficult choice; all three cocktails were well done, and each was entirely distinct. 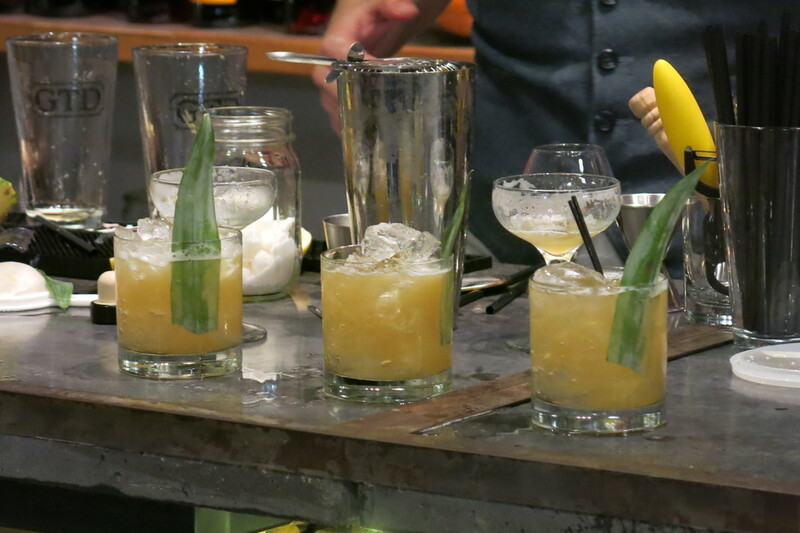 When attendees decided on a favorite, they deposited a drink stirrer in a jar in front of their chosen bartender. When all the straws were tallied, Lonnie announced that Tom Hardy of Canary Square would be moving onto the final round. Who would be Tom’s opponent? That would depend on the outcome of Round 2. The always pleasant Mike Wyatt is the bar manager of Ward 8, a cocktail bar that stands out in the North End by virtue of its not being an Italian restaurant. His drink, the Copp’s Hill, combined Wire Works gin, St. Germain, lemon juice, Campari, and blood orange zest. Balancing dry and bitter components with the floral St. Germain, this was a very drinkable cocktail with bright citrus notes. Hailing from Tavern Road in the Fort Point area, Ryan McGrale offered Crane’s Courage, a mix of Wire Works gin, lemon juice, cranberry shrub, and egg white, topped with a few drops of Craneberry liqueur. This deceptively simple cocktail was surprisingly complex, with the vinegary tartness of the cranberry shrub, the dryness of the gin, and the creamy texture that the egg brought to it. The most unusually named cocktail of the evening was undoubtedly the Flugelbinder. Bartender Matthew Coughlin of Cinquecento explained that the South End building that now houses the Italian bar and eatery was once a factory that manufactured flugelbinders – the plastic tips at the end of shoelaces. The drink of the same name was vibrant, soft, and floral, combining Wire Works gin, a house-made rosemary cordial, pear puree, and lime juice, garnished with sprinkling of plastic shoelace tips (kidding). M.C. Lonnie gathered up the voting jars, counted the straws, and announced that Ward 8’s Mike Wyatt had emerged victorious. That meant the final contest was about to begin – but not without a couple of curveballs. First, as if the pressure of competing mano y mano wasn’t enough, Tom and Mike would not be remaking their winning cocktails. Instead, the final round would test their mixological reflexes by forcing them to devise a new drink using a mystery spirit. 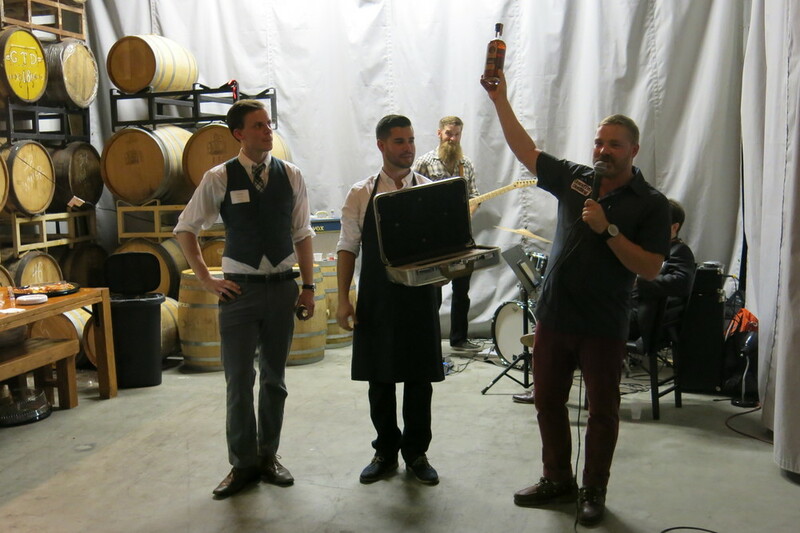 Lonnie kept the contestants and audience in suspense as long as he could, taunting everyone with a steel briefcase that held the secret ingredient. Finally it was unveiled – Fire Puncher Black, GrandTen’s seasonal offering that infuses vodka with chipotle peppers and cocoa nibs. Chocolate and spice combine in exciting, sensual ways, making this vodka a delicious, decadent treat. But mixing it into a cocktail would challenge any bartender. And they had only 15 minutes to make it happen. The final round had one other twist. Instead of leaving the voting to the whims of the populace, the winning drink would be chosen by three handpicked judges: Fred Yarm, bartender at Harvard Square’s Russell House Tavern, author of Drink & Tell: A Boston Cocktail Book, and the writer of the Cocktail Virgin blog; Spencer McMinn, head distiller at GrandTen; and yours truly, Boston BarHopper. The atmosphere was understandably tense. As the seconds ticked away, Tom and Mike feverishly mixed, sampled, made notes, tampered with one another’s ingredients, exchanged unrepeatable insults, and ultimately came up with two completely different cocktails based on the sweet and spicy vodka. 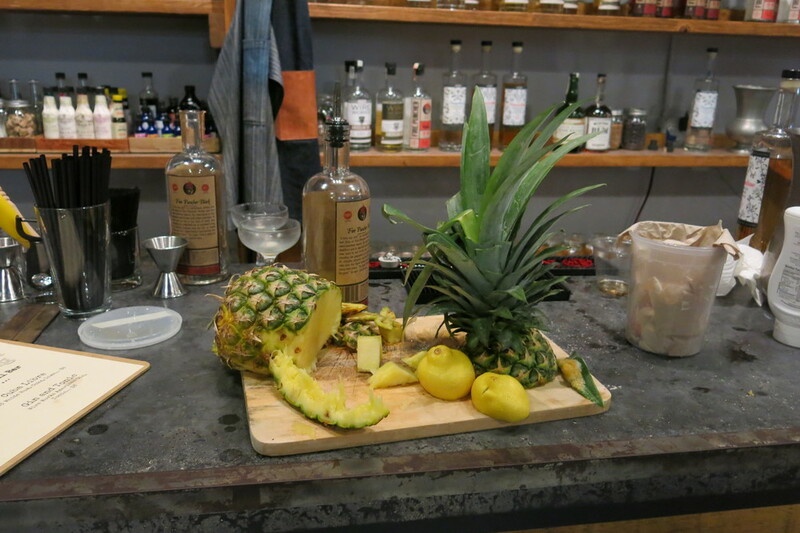 Tom’s drink mixed the featured spirit with fresh pineapple and GTD’s Amandine, a barrel-aged almond liqueur, for a surprising tiki interpretation. The combination of the chocolate and pineapple was unexpected, but it worked well, and the peppery heat was fairly prominent. Mike’s concoction was more of the seasonal variety, mixing the Fire Puncher Black with cream, egg white, and Amandine, dusted with shaved nutmeg. 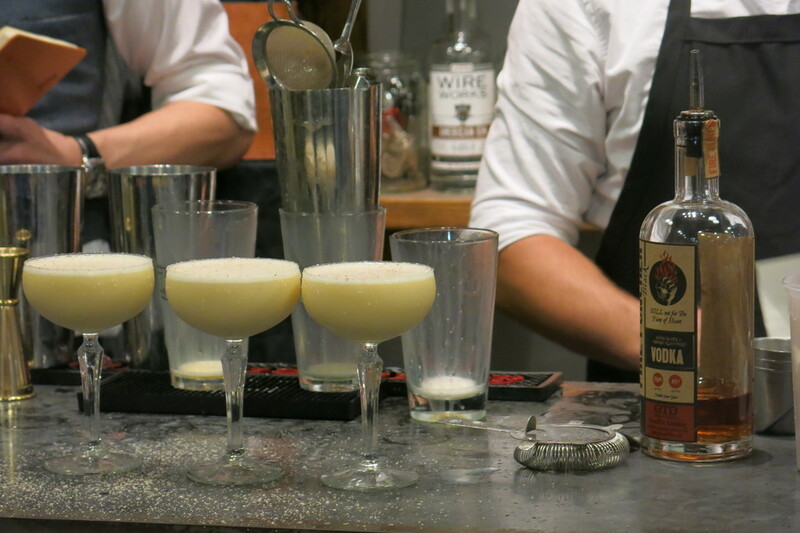 The combination of egg and cream muted the vodka’s heat but was a natural partner for the chocolate notes. Fred, Spencer, and I had our work cut out for us. Our loyalties wobbled and swayed as we sipped both drinks and discussed their respective merits. With the restless crowd circling us and demanding a ruling, we begged Lonnie for one more minute to finalize our decision. In the end, Tom Hardy’s tropical deployment of the Fire Puncher Black got the nod by a score of two to one. And while the vote wasn’t unanimous, our appreciation for both cocktails was. Being able to whip up an original drink on short notice with such an unusual spirit is no easy feat, but neither Tom nor Mike seemed overmatched by the task. The dueling cocktails made for a dramatic end to the evening. 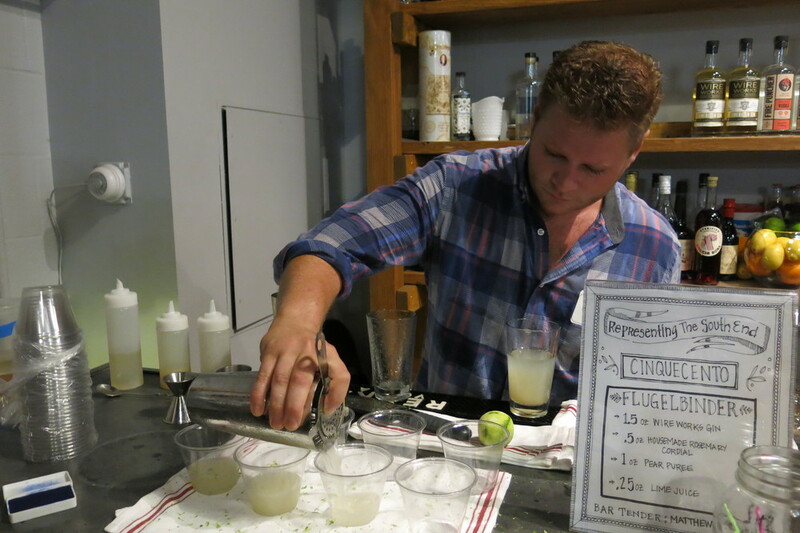 And while the spotlight was on the six bartenders and their excellent drinks, there was plenty of buzz about the Boston Preservation Alliance and their noble mission. The event was actually the brainchild of the Young Advisers of the Boston Preservation Alliance, a group of professionals under the age of 40 whose goal is to get younger generations interested in the Alliance and its work. And holding an event in a modern distillery housed in a 200-year-old building reminded attendees that there’s much about Boston that should be preserved. Copyright © Boston BarHopper. All Rights Reserved.